Russell Simmons—hip-hop mogul, fashion executive, and reality TV star, is the fourth richest hip hop entrepreneur and now he wants to take Meditation Mainstream. He's passionate about bringing meditation to a younger generation and more specifically "the hood" as he says. Simmons was the former owner of the pioneering hip-hop label Def Jam, a founder of Russell Simmons Music Group, and the creator of the clothing fashion line Phat Farm and the fragrance label Atman. With all that influence and name power he may just be onto something huge. 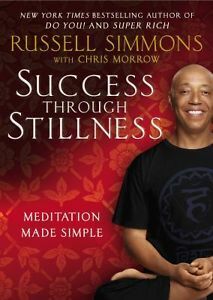 With his new book, Success Through Stillness, Simmons aims to bring meditation into schools. By enlisting the help of some celebrity friends like Oprah Winfrey and Ellen DeGeneres, he hopes to create enough buzz around the importance of meditation to help students throughout the country. “I'm going to Chicago, I want to get Rahm Emanuel … to join me along with the chancellor of schools and give meditation to students,” Simmons said. “The violence in those communities — you know it reduces violence — so it's very important. If you want to be tough...see what it's like to be in prison...you'll have a tough life." Simmons wants to teach that meditation is 'cool'. "The cool dude is the meditator and you want to be that. Meditation brings you to your true power. Russell believes that meditation helps to 'wash your mind' of all the noise and then 'reboots' it, so to speak. "Meditation promotes stillness and in the stillness you can think. You have to give kids stillness. It teaches them to drive their ship. The practice of touching that stillness allows you to understand yourself, to comprehend and to focus. The first step in educating is to learn to focus." Russell believes that kids today have so much noise going on in their lives with bullies and anxiety and pressures that it makes it impossible to find the focus to learn, to succeed. " It's a difficult place to grow up in. It's critical for kids to get it. Teaching them to meditate is teaching them to learn. Teach kids to be calm...give them a shelter, a refuge from the false world. Meditation is the connection to a happy, joyful self. Kids' only job should be to be happy." Russell believes the communities benefit...the communities calm down." 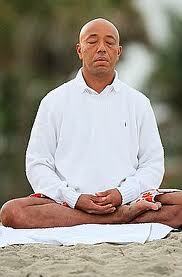 Simmons states that "meditation is basically the core of my existence. I don't want the noise to separate me from the greatness that is inside me. When I meditate I am more comfortable in my seat. I want to be able to operate from that space. When you're awake you can go get what you imagine. Life becomes easier."